The baccatum species, familiarly termed “ají” throughout South America, originated either in Bolivia or in Peru and, according to archaeological evidence, was probably domesticated in Peru about 2,500 B.C. Extensive baccatum material found at the Huaca Prieta archaeological site in Peru shows that the species was gradually improved by the pre-Incan civilizations. Fruit size increased and the fruits gradually became non-deciduous and stayed on the plants through ripening. There are at least two wild forms (varieties baccatum and microcarpum) and many domesticated forms. 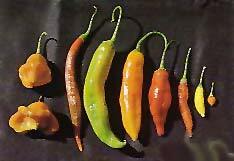 The domesticated ajís have a great diversity of pod shape and size, ranging from short, pointed pods borne erect to long, pendant pods resembling the New Mexican varieties. One variety of aj, puca-uchu, grows on a vine-like plant in home gardens. The baccatum species is generally distinguished from the other species by the yellow or tan spots on the corollas, and by the yellow anthers. Baccatums are cultivated in Argentina, Colombia, Ecuador, Peru, Brazil, and Bolivia, and the species has been introduced into Costa Rica, India, and the United States. In the United States, they are grown to a very limited extent in California under the brand name Mild Italian and in Nevada under the brand name Chileno. The species name “baccatum” means berry-like, an allusion to the smaller-podded varieties. The baccatums are tall, sometimes reaching 5 feet, have multiple stems and an erect habit, occasionally tending toward sprawling. The large leaves are dark green, measuring up to 7 inches long and 4 inches wide. 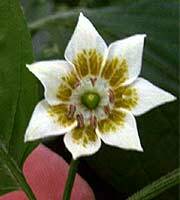 The flower corollas are white with distinctive dark green or brown spots; anthers are yellow or tan. The pods usually begin erect and become pendant as they mature,are elongate in shape, measure between 3 and 6 inches long and ¾ to 1½ inches wide. They usually mature to an orange-red, but yellow and brown colors also appear in some varieties. The pods usually measure between 30,000 and 50,000 Scoville Heat Units. The baccatum plants tend to stand out in the garden like small trees. Their growing period is up to 120 days or more, and the plants can produce 40 or more pods. The pods have a distinctive, fruity flavor and are used fresh in ceviche (lime-marinated fish) in South America. They are also used in fresh salsas and the small yellow varieties are prized for their lemony aroma. The pods of all ajís are also dried in the sun and then crushed into colorful powders.